There are many pressures for change regarding the dissemination of research, such as the current Web 3.0. technology environment in education, open access journals/repositories and the consolidation of citation metrics tools. Professors and researchers shared with us their vision about the future of publishing, voting in the poll. Indexed journals have been adding high value to all academic stakeholders, and they will be. “Open access journals/directories with peer review” was the preferred mean of dissemination, with 29% of the votes; it makes sense due to the expectation that citation rankings are creating. Both added, “Indexed journals” + “impact factor”, would be the most voted (39%); the current journal system still prevails. 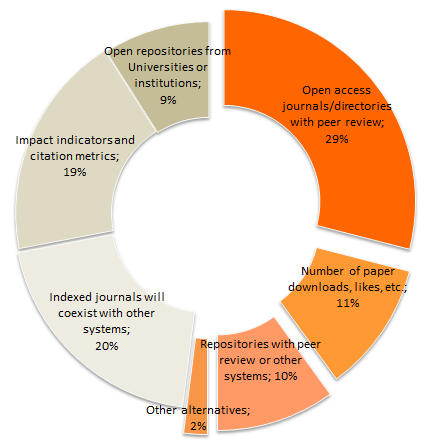 “Repositories with peer review” + “number of downloads”, were voted by 21% of respondents, opening an interesting way to new alternatives for the dissemination of scientific knowledge in academia. Professors are rational people with common sense, we understand that change is needed in the system, but little by little, as it is working reasonably well. 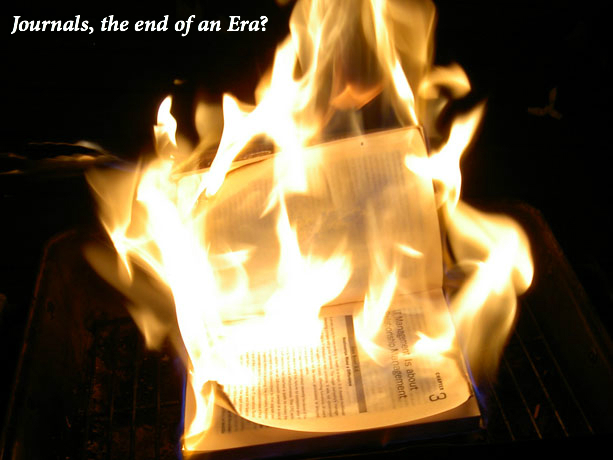 It’s like we will be waiting to see how those changes develop and how journals and publishing houses respond to them. Sure they do well. * The poll was posted in June 2013 in many academic discussion groups. Around 900 answers were collected. The main drivers of change regarding the assessment of research quality and its dissemination are the current Web 3.0. technology environment in education, open access journals/repositories and the consolidation of citation metrics tools. Indexed journals have been adding high value to all academic stakeholders: professor, researchers, publishers, editors, professionals, universities, faculties and libraries; but has arrived the time for journals to change? Shape the future of publishing voting in the poll. Share with us your vision.